The Wheat City Lawn Bowling Club was created in 1916 when a group of railroad workers living in Brandon’s east end were denied access to the existing Brandon club. This group were given use of land at Rideau Park. Given to Bob Hoffman by Harold E. Watson, who recieved it from Jean Findley Booth, daughter of Harry and Mrs. Findley of Brandon. Donated to the Daly House Museum by Bob Hoffman in 1998. 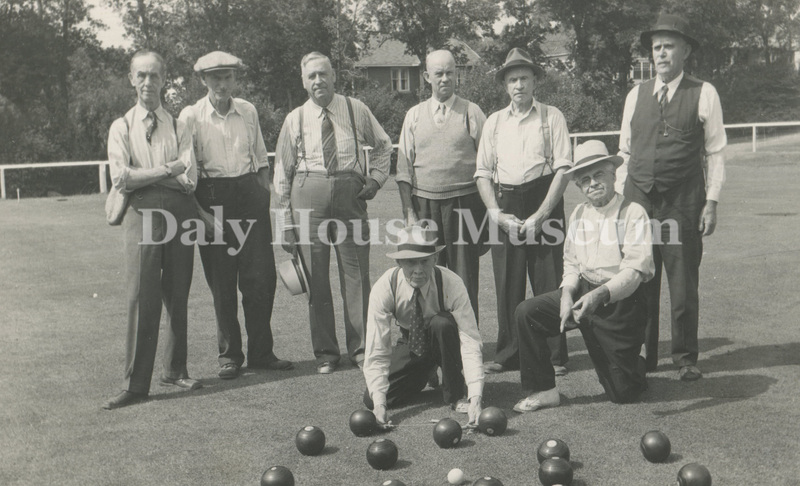 Photograph of an eight members of the Wheat City Club Lawn Bowling team. Members are listed as: B. Willdey, S. Charlesworth, C.H. Johnson, H.W. Budd, H. Findley, J. Hotson, P.W. Cook, and Billy Muir.